Former USec Francis Baraan III: Was he really involved in drug trafficking at the New Bilibid Prisons? July 31, 2017 - by benign0 - 2 Comments. Last we recall, Senator Leila De Lima remains locked up on charges of “sale, trading, administration, dispensation, delivery, distribution and transportation of illegal drugs” related to allegations that she was involved in a conspiracy together with other high-ranking government officials to allow a multi-million peso drug trade to flourish within the National Bilibid Prisons (NBP) in Muntinlupa. Also charged of the same offense is her former driver and purported lover, Ronnie Dayan. 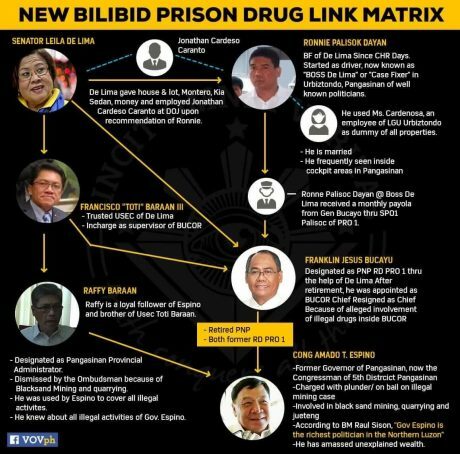 A “matrix” of De Lima’s alleged links to the drug trade was released by Philippine President Rodrigo Duterte in August, 2016. The matrix included Baraan. An enhanced version of Duterte’s drug link “matrix” that made the rounds over social media in late 2016. Three arrows from De Lima point to former Undersecretary Baraan, Bucayo and Dayan. BUCOR stands for Bureau of Corrections. An arrow connects Undersecretary Baraan with his brother, Pangasinan City Administrator Raffy Baraan, who is connected with Espino, described in the matrix as the “richest politician in Northern Luzon,” and another arrow with Bucayo. According to the matrix, Espino used Raffy Baraan as cover for his alleged illegal activities. Espino has been charged with plunder for illegal mining case. Both Espino and Baraan were involved in black sand mining in Pangasinan. Following the release of the “matrix”, former Undersecretary Baraan vehemently denied his involvement in this alleged drug trade citing his “limited” role in the administration of the state correction facilities. “As [an undersecretary] having limited administrative supervision of BuCor, I never oversaw, either on the ground or from a distance, the prison operations in BuCor’s seven penal colonies, more so the [New] Bilibid Prison in Muntinglupa. As wrongly reported, I was not Usec in charge of the Bilibid: this is a total misconception,” Baraan said. Baraan said his typical day at DOJ included reviewing of folders of BuCor contracts and documents endorsed and reviewed by the DOJ technical services. He said after reviewing them, he would countersign them for De Lima’s signature. De Lima also came to the defense of her former subordinate, reaffirming Baraan’s insistence that he has “limited” involvement in the running of the NBP. De Lima insisted that Baraan has no direct charge and supervision over operations at the NBP and other penitentiaries under the jurisdiction of BuCor. “I can confirm that explanation of his—I confirm na as Usec. in charge of BuCor, he has limited administrative supervision over BuCor,” said De Lima. “Naaalala ko nga, halos hindi yan sumasama sa akin yan dun sa mga raids ko, dun sa mga ocular inspection ko,” she added. In September 2016, NBP inmate Herbert Colanggo tagged Baraan as a key authority figure in the alleged drug ring De Lima oversaw. Baraan worked with a certain “Susan”, according to Colanggo, to collect money to facilitate the transfer of inmates from one location to another within the NBP compound. Baraan, as expected, denied all of these accusations calling them “outlandish”. Colanggo is one of the highest-profile convicts at the NBP. 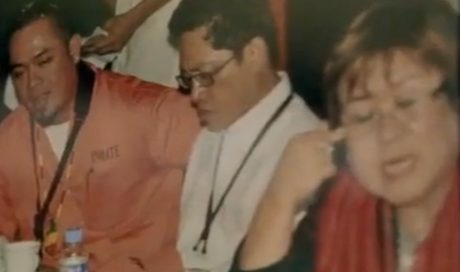 He had access to many perks within the NBP under De Lima’s alleged watch and is famous for launching a successful singing and recording career while in prison. The scale at which the illicit criminal operations transpiring at the NBP defies imagination. It is difficult to imagine that De Lima could have possibly been involved in such large operation unknown to her key subordinates within the Department of Justice. Indeed, Duterte had since apologised to three people named in his “matrix”, “Pangasinan Rep. Amado Espino Jr., Board Member Raul Sison and former provincial administrator Rafael Baraan”. However, there is scant information on Undersecretary Baraan and certainly no apology coming from Duterte despite his being supposedly “cleared” of all charges. Some have also observed that there has been no information on whether or not former Undersecretary Baraan had even returned to the Philippines after his “health and medical” escape to the United States last year. Is Baraan truly innocent of involvement in the drug trade at the New Bilibid Prisons when Senator Leila De Lima was Justice Secretary and his boss back during the administration of now-former President Benigno Simeon’BS’ Aquino III? The search for the truth continues. Baraan sought refuge in the U.S. However, he can be arrested in the U.S., as a criminal Alien….who was a Shabu Drug Dealer. The U.S. Attorney General could deport him, as undesirable alien, with the request of Pres. Duterte. It was the worst corruption, I have ever seen in Philippine political history… criminal inmates were involved, with government officials. The Jailers and the Jailed had symbiotic relationships….only in the Philippines !